Our favourite kind of updates here at HQ are the comments we receive from customers long after their building has been installed. 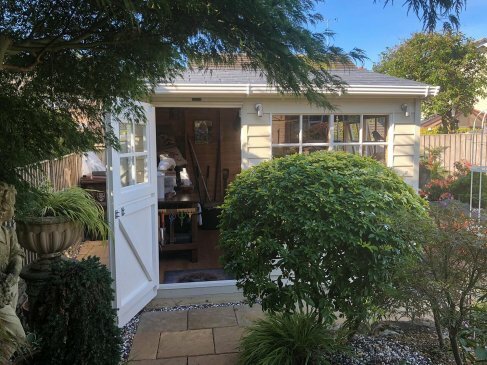 We have received some wonderful feedback and beautiful photos from a very happy customer and their building, a stunning Superior Shed that was installed in Staffordshire in the summertime and has since settled into its splendid garden where it is used as a workshop. 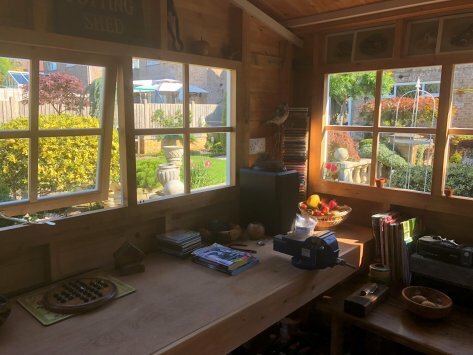 The customer uses their workshop as a peaceful retreat to tinker on DIY projects inside, while being able to enjoy the lovely view to his garden. They have retrospectively fitted a power socket too, which he has used to plug in speakers to allow him to play music, personalising the space to his needs. This may also help in the winter to provide heat if he wants to use it throughout the year. Measuring 3.0 x 3.0m, the shed has an apex roof which gives it an eave height of 2.0m, an important factor for an efficient workshop. There is an opening window to allow fresh air to circulate, which is also necessary when working with tools that may produce dust or sawdust. Internally, the customer opted to add one of our sturdy workbenches, running along the gable end of the interior, measuring 3.0m. Our workbenches are made from oak-faced plywood, and are 600mm deep for a solid, sturdy finish. 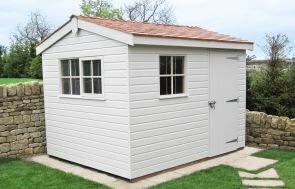 Aesthetically, the exterior of the shed is clad with rustic weatherboard style cladding, which gives it a classical and traditional look. It is painted in a two-tone fashion, with a contrasting colour on the doors and windows. The two opaque, natural shades selected by the customer from our vast range of options are Sandstone for the walls, and Ivory to highlight the door and windows. The roof is covered with our grey slate-effect tiles for an attractive, timeless look. Our other roof options include cedar shingles, heavy-duty, heat-bonded felt and slate-effect tiles in terracotta. Our composite slate tiles are a popular option for workshops and sheds alike as it looks clean, contemporary and timeless, merging well with a variety of different surroundings. Our customer also opted for Georgian windows to finish off the exterior of the building nicely and to add more of a traditional feel. All of our Garden Shed windows feature 4mm toughened safety glass with double glazed options also available. Along with our wide range of additional features, our buildings can be as customisable as you wish, with options such as additional Velux® windows and alternative window styles. Other features added by our customer include white guttering along the fascia boards to keep off the wetter weather, and our security pack feature, which offers unscrewable security screws on the door hingers and a heavy-duty sliding bolt with a fully encased 7 lever lock. Our security pack offers that additional peace of mind and significantly reduces the risk of being burgled. You can read more about our security pack here. 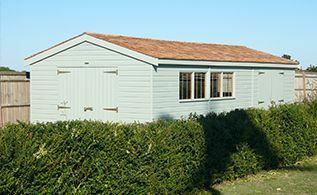 We can cater for a wide range of personalisation options and offer additional extras that allow you to create your dream building, whether you want something simple or a shed to use throughout the year. These include partition walls, complete insulation and oak-faced ply lining, electrical packages, and a variety of exterior paint finishes. 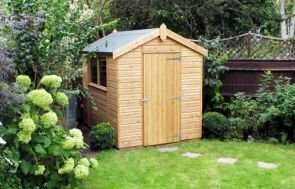 If you’re thinking about purchasing a shed to create your ideal workshop, take a look at our buyer’s guide article: 10 Things To Consider When Buying A Garden Shed. 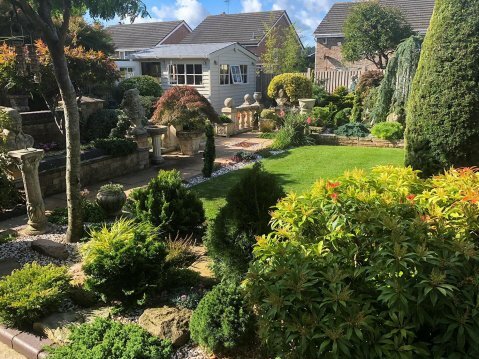 You can also call us on 01760 444229, or visit us at any of our UK show centres, where we have up to 25 buildings on display and a team of friendly advisors on hand to assist you and answer any queries you might have.